I have been back in India for over two months now. Every day since the return, my mind accumulated so many thoughts, some discomforts to blog about, so many lacunae that I either did not see before or wasn’t used to anymore, so many inefficiencies to fix. I had been desiring to write about each one of them. But my self-doubts and procrastination kept me from doing so. But as we approached Diwali, I was feeling motivated to write something. Something. Anything. Due to poor health I was almost bedridden for a while, so I started going for a slow walk in the evening. I would leave phone at home. I would just try to observe the mélange of activities all around me. I saw many people happy, excited. Men, women, kids, adolescents, elderlies, shopkeepers, street hawkers, grocery sellers – all seemed under some euphoria. I wanted to know what was it that excited them so much, while I was still struggling to make peace with faulty foot over-bridge, or poor cell reception. I began to observe sharply and hear closely. A woman was happy she got 2 kilograms of potatoes at a desired price. A teenage boy was just happy to see some text message flashing on his cell phone. The tailor at the corner was happy because the woman liked the blouse he had stitched. The elderly woman next door was happy after washing the area in front of her house to see it clean. Kids riding pillion on the motor cycle of Rawat ji were happy because they got an extra box of phuljhari which they didn’t expect Rawat Ji to buy them. I realized that they were happy for the milestone of that hour. The accomplishment of that hour meant the world to them. In that hour, rising prices or plaguing corruption didn’t stand a chance to appear. And it should not because mere thought of that while cleaning the front yard of one’s house or buying potatoes wouldn’t serve any purpose. Moreover, many of them seemed wise to pick the battles. They seemed to have given up hopes on some problems beyond their control and put their hopes on personal things that matterred more. With these realizations, when I finished my walk on Diwali evening and walked back in house, my mother was cleaning diye and preparing rest of the paraphernalia for the Lakshmi Puja. 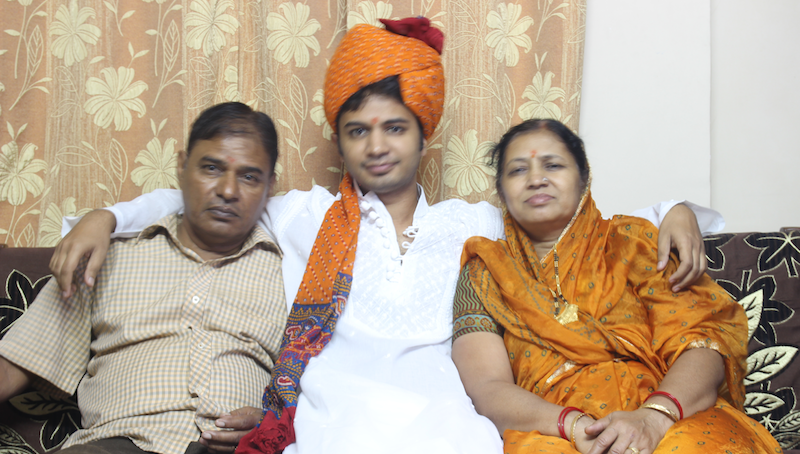 The three of us – me, my father and my mother – showered and wore clean clothes , and worshipped. We ate simple meal. We watched all the prime time soaps like any other weekday. And before the smoke could creep in, we closed the doors and called it a night. It was a Happy Diwali because all three of us could be there, alive, reasonably healthy, together.